Product prices and availability are accurate as of 2019-04-20 18:59:33 UTC and are subject to change. Any price and availability information displayed on http://www.amazon.com/ at the time of purchase will apply to the purchase of this product. Author Bookstand is proud to offer Southern Law Journal, Spring 2012 by Bookstand Publishing. Bookstand Publishing offers books by the best indie authors throughout North America and the world. Bookstand Publishing is dedicated to offering original content to a broad audience and promoting great authors, literacy, and freedom of expression. 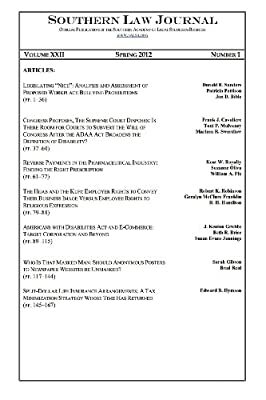 Southern Law Journal, Spring 2012 has generated a lot of interest and excitement and we think it would be an excellent addition to your library. 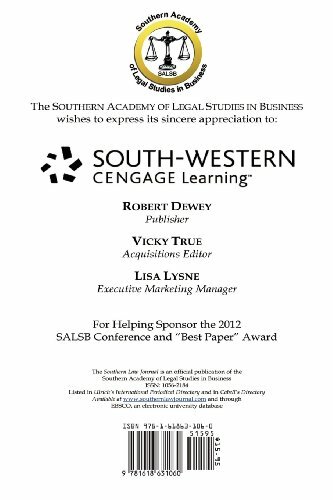 SOUTHERN LAW JOURNAL is the official publication of the Southern Academy of Legal Studies in Business. It is published in hard copy and electronically on the SALSB website. The SLJ is deposited in hard volumes in over 100 public and university libraries (ISSN: 1056-2184), free of charge. Copyright to the contents of the articles published in SOUTHERN LAW JOURNAL is retained by the respective authors. Copyright to the design, format, logo and other aspects of this publication is claimed by the Southern Academy of Legal Studies in Business. The views expressed herein are to be attributed to the authors and not to this publication, the Southern Academy of Legal Studies in Business, its officers, the editors, or any named college or university. The material appearing in this publication is for informational purposes only and should not be considered legal advice or be used as such. For a specific legal opinion readers must confer with their own legal counsel.